How Do Blue Crabs Get Their Food? Blue crabs will eat almost anything, but getting even the simplest meals takes at least a modicum of work, such as scouring the area for plant matter or dead fish. The more difficult meals call for a bit of claw-crushing action, hitching a ride with high tide or waiting, watching and sensing. When the waves crash farther and farther onto the shore during high tide, blue crabs spring into action. They swim into the salt marshes in search of food, fiddler crabs and snails in particular. Snails typically cling to the stalks of grass in the marsh. Blue crabs have reached up as high as 7 centimeters out of the water to pluck marsh periwinkles, a type of sea snail, from the grass. Blue crabs aren't always on the go in search of food sources. Sometimes they wait silently, digging beneath the sand, exposing only their eyes. When prey swims or, in the case of other crustaceans and snails, walks past, blue crabs reach up and capture the prey between their claws. This explains one reason why it's not unheard of to accidentally step on a blue crab while in the ocean. Unlike some animals who are very particular about their food, blue crabs don't much care what they eat. They feast on fish -- dead and alive -- other crabs, snails, oysters, clams, shrimp, worms, detritus and plant matter. National Geographic notes that blue crabs play a vital role in controlling populations of animals they prey on and that regions that have experienced overfishing of blue crabs often see the local ecosystem suffer in several ways. Fish and plants might be easy enough to eat, but getting clams, snails and the like out of their shells requires a bit of work on the part of the blue crab. Typically, the crabs will crush the shell entirely between their claws. 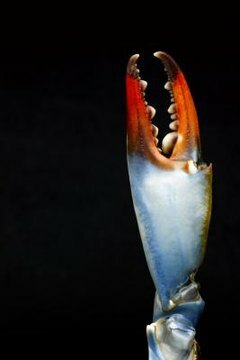 In the case of animals who have two shells and can close up, such as clams and oysters, blue crabs may slip a claw between the shells and pry the shells apart. Like most animals, blue crabs use their vision and sense of touch to identify and track prey, but they also make use of chemical receptors to sense a prey's chemical scent. The effectiveness of pinpointing that scent often depends on the flow of water. For instance, blue crabs can track clams in low-velocity flows, but struggle in high-velocity flows, according to a 2009 report by Mark Hay, a biology professor and the Harry and Linda Teasley Chair in environmental biology at the George Institute of Technology. What Kinds of Animals Have Ten Legs?